The flexible axis ports can be configured in software as feedback devices or pulse direction outputs. As outputs they can be used as pulse and direction with stepper or servo drives or they can operate as a simulated encoder output. When configured as feedback they can be either incremental encoder input or one of three popular absolute encoder types; SSI, Tamagawa or Endat. Any feedback axis with a voltage output can be used to form a closed loop servo. 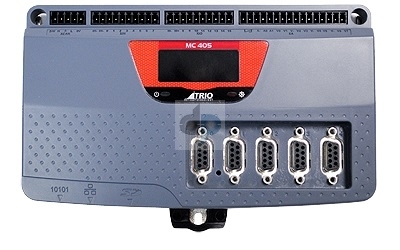 The built-in Ethernet port allows programming and connection of common HMI and PLC protocols directly to the MC405. User programs can be written in Trio’s established multi-tasking TrioBASIC language using the powerful Motion Perfect application development software making complex motion easy. Also available as an option is the industry standard IEC 61131-3 languages allowing fully functional PLC programming system. The MC405 is available in 2 different axis configurations. Both models feature a total of 16 axes in software. Any axes not assigned to built-in hardware can be used as a virtual axis. Every axis can be programmed to move using linear, circular, helical or spherical interpolation, electronic cams, linked axes and gearboxes.